The Application Development Initiative Group (ADI) will be hosting a Hackathon in the Watson Library of Business & Economics starting at 4pm this Friday, February 3rd, and ending at Noon on Saturday, February 4th. 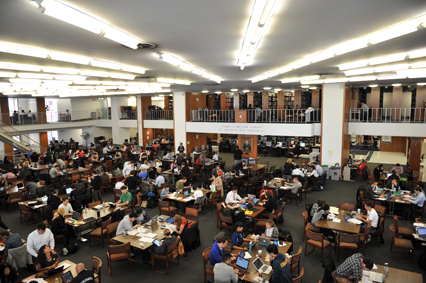 During this time, use of the main ground floor reading room and study rooms (G01-G17) will be restricted to use by Hackathon participants. The rest of the Library (including the computer workstations, 1M & 2M study spaces, and mezzanine study rooms) will remain accessible to all eligible patrons as usual. To contact the Watson Library staff, please call 212-854-7804 during our open hours or send an email to business_circulation@library.columbia.edu. Thanks. This entry was posted in Hours on February 1, 2017 by Michael.